Try Continuous Ink System with your Brother MFC-6490CW and make 30 times more quality prints for the same money! Pay only 0.04 USD for A-4 full color print! Ink System for Brother mfc-6490cw: color printing of A3 format has become more cheaper! The owners of small offices may greatly benefit from a good device with multiple functions. Printer Brother allows to print, scan, copy, and also has extremely small sizes. But still there is one reason why users are satisfied with the serial devices of usual size вЂ“ and that is the price. MFD, which operates with the documents of A3 format, will become much more expensive. This printer is the first professional serial model by manufacturer Brother, which offers not only exclusive quality printing, but also small price, exactly these features usually draw our attention most of all. How to decrease printing expenses with the help of ciss for brother mfc-6490cw? Early or later one problem appears вЂ“ how to reduce expenses for ink down to minimal ones and to make color printing as cheap as possible. It is very easy. You should install the continuous ink supply system ciss ink system brother mfc-6490cw into your printing device. The continuous ink supply CISS for mfc-6490cw from the external reservoirs вЂ“ is an optimization device for inkjet printers. 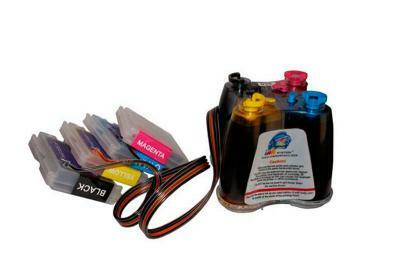 The ink reservoirs in the system ciss brother mfc-6490cw are connected by a rather elastic loop with special cartridges, which are installed at their regular places in the printer (as well as original cartridges), and next models ciss for brother mfc-j265w and ciss for brother mfc-j5910dw are made according to the same principle. As the printing goes on, the ink in the cartridges is running out, and lower pressure appears, due to which the ink flow from the outer tanks to working cartridges is going on along the elastic loop. Exactly this way the ciss mfc-6490cw (system of continuous ink supply) to the print head is implemented. Bulk ink system for brother mfc-6490cw вЂ“ this is a ready for work unit, which is necessary to connect to the printer according to the illustrated detailed manual enclosed. The ink, which is enclosed to each set with the given device, corresponds to the manufacturer demands of inkjet printers Brother. Using cis brother mfc-6490cw for your printer you will spend your money only on ink, which you may refill in the ink tanks. And the cost of ink in this case will be several times lower, than the cost of original ink cartridges. For instance, if one liter of high quality ink costs about 40 dollars, and the cartridge, containing 10ml of ink, costs approximately 10 dollars, so the difference will be great and this will affect the cost of photo printing.